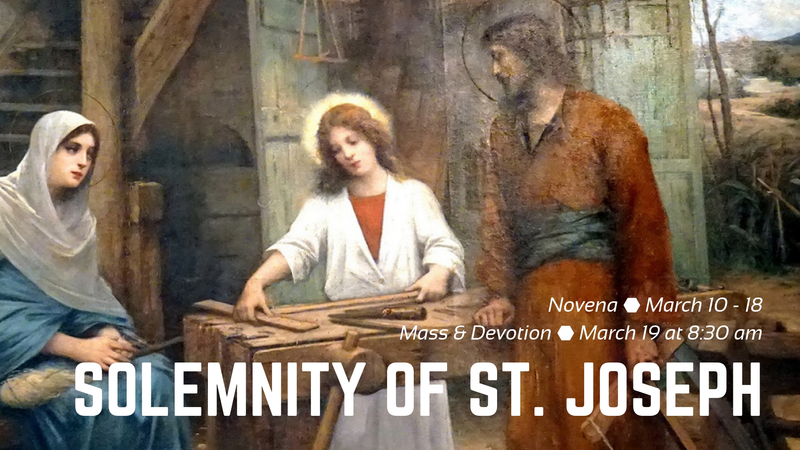 We will be praying this novena after each daily Mass from March 10th to March 18th. The novena can also be prayed individually throughout the week. A novena is nine days of prayer for a petition or thanksgiving. It derives from the nine days the Apostles prayed between the Ascension and Pentecost. Oh, St. Joseph, whose protection is so great, so strong, so prompt before the throne of God, I place in you all my interest and desires. Oh, St. Joseph, do assist me by your powerful intercession, and obtain for me from your Divine Son all spiritual blessings, through Jesus Christ, our Lord. So that, having engaged here below your heavenly power, I may offer my thanksgiving and homage to the most loving of Fathers. Oh, St. Joseph, I never weary contemplating you, and Jesus asleep in your arms; I dare not approach while He reposes near your heart. Press Him in my name and kiss His fine head for me and ask Him to return the Kiss when I draw my dying breath. St. Joseph, Patron of departing souls, Pray for me. St. Joseph obtain for us all that we truly need through the Immaculate Heart of Mary. Amen.